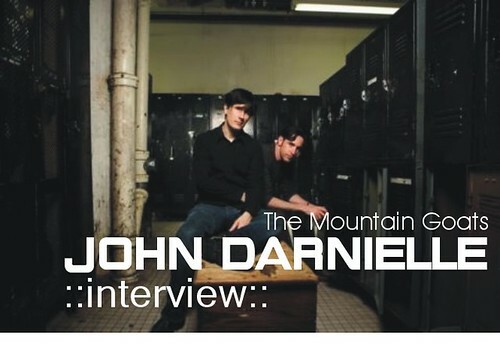 John Darnielle, leader of The Mountain Goats and a very generous man, has given a bit of his time to answer a handful of questions posed by *Sixeyes MP3 Blog. And, not surprisingly, he has made those said questions appear so much better, simply by answering them. Darnielle is a man whose passions can lean towards the aggressive (i.e. heavy metal and boxing), but his music doesn't readily exhibit these qualities... the music does not, but the lyrics can and do. This is a man whose mind and pen can shape words into hooks, crosses, and jabs, or into brush and paint. He unveils images and takes no prisoners. His art is suspense, you don't know what will happen next, but you feel the tingle of anticipation. John Darnielle answered my questions via email. *Sixeyes: Get Lonely is such a quiet record (or quieter, with respect to The Sunset Tree), in no small part a result of your soft upper register singing on many of the tracks. I was wondering if producer, Scott Solter, had a hand in deciding to record live in the studio? Was the overall softer tone a by-product of your recording method, or was it preconceived? John Darnielle: It was kind of unexpected, but kind of not - going into the studio is always a combination of executing plans & finding out stuff you didn't know. I had all these songs and they seemed pretty quiet, but they were all in demo form, and there's a lot of ways you can sing a song - but when we started playing them together, they really seemed like they called for really understated, natural vocals. It seemed like trying to force them or put them across too forcefully would have killed the mood, and the more we worked, the more this sort of slow-burning dark shadowy mood asserted itself. *Sixeyes: You'll be 'on the road again', in support of Get Lonely (4AD), late summer and early fall. Do you feel, at all, empathy towards Willie Nelson's song, "On the Road Again"? 'On the road again, I just can't wait to be on the road again…' Could you ever sing that line and mean it? John Darnielle: This song is totally underrated! People only know the first line and stuff, but Willie Nelson is one of the best singers & songwriters around - the song is very direct and honest in a way that makes (mainly very young) people uncomfortable, but if people will just stop trying to be hard-assed for a minute, how can one not feel a line like "the life I love is making music with my friends"? Too "corny"? Whatever - playing music with people is pretty much the most fun you can have, right? At the same time the part about being on the road...I mean, playing music is great, touring kinda isn't great except for the playing-music part. But the Willie Nelson song is mainly about the communal feel of touring, about how when you play music with people night after night you achieve a sort of intimacy you can't get elsewhere - what musician couldn't relate to that? *Sixeyes: I was hoping you could compare the studio demeanour and methods of Scott Solter and the producer of 2005's, The Sunset Tree, John Vanderslice. How do these two, who have spent hours together in the studio, differ? And what do you feel each brings out in you when you're recording? John Darnielle: Well, they worked together on the preceding two records, so the difference is one of degree: JV brings a very excited pop energy to producing, he's a big Bowie fan so he's always got his eye on that Scary Monsters balance between pop and arty y'know. Scott, he's a dub fiend and a huge PiL fan, when you hear those big resonant bass notes or some reverb'd-to-oblivion vibraphone you know you're hearing Scott's vision, which is kind of ECM to JV's Mainman. *Sixeyes: A little off topic, when you read, do you gravitate towards fiction, or non-fiction? And in the same area, are there any magazines you're a fan of? John Darnielle: I read mainly fiction. I always feel like I should read more history, so I try to, but I like novels and poetry. I read magazines constantly because I'm always on planes: Frets, The Ring, Boxing Digest, Harper's, Vintage Guitar. *Sixeyes: How is the rest of this year and 2007 shaping up for The Mountain Goats? Should Europe and Australia expect to see you, as North America will? John Darnielle: I don't know if Europe's in the cards, but Australia in the new year for sure, like January. I just put up a load of new tour dates at mountain-goats.com - we'll be running around like headless chickens through November. BUY Get Lonely via ampcamp or insound. Download Get Lonely through eMusic and their free trial offer of 25 MP3 downloads. More live performance mp3s found here. Go here for a large number of mp3s. There are some mp3s on this page. All 'First Fall Tour' shows with the amazing Christine Fellows. Nice job, Alan. Apparently, today was Post An Interview With A Musician Who Started Out Making Lo-Fi Pop In His Bedroom But Has Moved On To More Produced Works Lately Day, because I posted one too.